On June 12, we woke up to a world that is different. A world that looks darker and feels more dangerous than it did just one day before. We stretched, rolled over and checked our phones. Our eyes widened and we raised our hands to our mouths, shocked and appalled to learn the news: the previous night, a man named Omar Mateen had armed himself and entered Pulse, a gay nightclub located downtown. He opened fire. That man killed 49 of our friends. The mass shooting at Pulse is the deadliest attack on LGBTs in history. Nothing else even comes close. The previous largest attack happened back in 1973, when an arsonist burned the Upstairs Lounge in New Orleans, killing 32 people. There is only one other incident of a mass shooting in a gay bar. It happened in 2000 at the Backstreet Cafe in Roanoke, Virginia, when a man opened fire and killed one person, wounding six. The Pulse massacre is the most violent terrorist attack on U.S. soil since September 11, 2001. It is both undeniably historic and unfathomably horrendous. 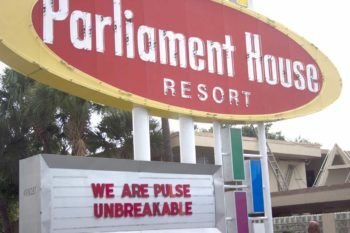 “Everyone get out of Pulse and keep running,” is the chilling message posted to Pulse’s Facebook page at 2:09 a.m. that deadly morning. It was last call at the club’s Latin night, and the three-room nightclub was packed with more than 300 people. Police reports and witness statements, given both to reporters and posted on social media, piece together a picture of what happened. The shooter entered the club at about 2:00 a.m., armed with a number of firearms, including a handgun and an AR-15-style rifle, a semi-automatic weapon capable of firing 45 rounds per minute. He opened fire. Most of the bar patrons report that they initially thought the gunshots were part of the music, or perhaps some audio equipment malfunctioning. Then they saw the blood. People scrambled for safety. Some dropped to the floor, some ran, some hid in dressing rooms or bathrooms. Some shielded their friends or family from the bullets. As people on the back patio got wind of the danger, they took off, trying to help the wounded as they ran. A video shared online after the event, filmed from a nearby 7-11, doesn’t show any of the carnage, but the audio is clear and haunting: a string of gunshots rapid, loud and relentless. 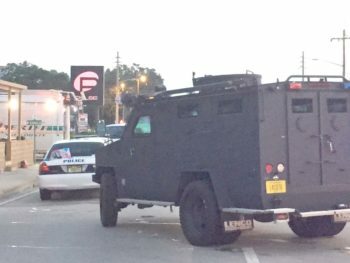 An Orlando police officer working extra duty at Pulse engaged in a gun battle with the shooter, and the suspect went deeper into the club. He ended up barricaded in a bathroom with hostages and negotiated with police for a couple of hours. In the meantime, responders outside bundled the injured into the back of pick-up trucks and transported them to Orlando Regional Medical Center for treatment. At 5 a.m., there was an explosion. According to Orlando Police Chief John Mina, the decision was made to breach the walls of the club, and officers exchanged gunfire with the shooter. That is when the killer died. Officers led about 30 hostages to safety. 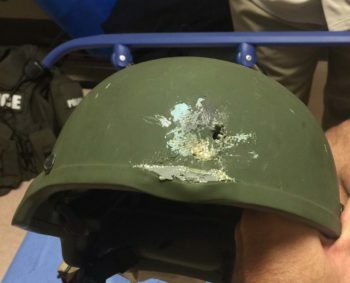 “Our First Responders and SWAT Team faced a hail of gunfire as they rescued the hostages, and we are blessed beyond words that none of them were gravely injured or killed,” wrote Mina in an email sent to his officers after the massacre, telling them how proud he is of the work they’d done. SWAT Commander Capt. Mark Canty describes what his officers saw when they entered Pulse. “It’s pretty horrific, you know. You talk about bodies laying around, they’re kind of just stacked up. You see that among the death, it’s pretty horrific,” Canty says. “Truckloads,” and “ambulance loads” of patients arrived at the hospital; these were the words of ORMC doctors speaking at a press conference June 14. According to Dr. Kathryn Bondani, the first patient they saw was relatively stable and they were hoping the other victims would arrive in a similar condition. Five patients in much worse condition arrived quickly after, followed by dozens more. Doctors and nurses flooded in to help. 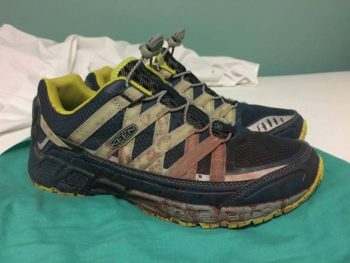 One of them, Dr. Joshua Corsa, posted a photo of his bloody sneakers to Facebook. The shooter hit the community where it hurts most: their safe space. Pulse’s owner, Barbara Poma, co-founded the nightclub (along with Ron Legler, who declined to comment for this story) in memory of her brother John, who died of AIDS in 1991. Cathy “Binks” Binkewicz, a Pulse bartender, reiterated that because Pulse was “calming” and “comfortable,” she never saw the violence coming. “The energy was very good in there. Very positive, always very good vibes in there. Just a loving place to be,” Binks says. Blue Star, who now owns and performs in The Venue, was an entertainer, then entertainment director at Pulse for about six years. Even though they weren’t there during the shooting, the employees’ familiarity with Pulse made their mental picture of the attacks disturbingly vivid. Once the news hit the dismayed community Sunday morning, two courses of action launched simultaneously. One, the people of Orlando rallied to help. Two, the people of Orlando refreshed a list of victims, over and over, praying not to see the name of a loved one. The city of Orlando created a web page listing victims’ names and ages, updated as next of kin was notified. First it was four. Then it was six. And on and on until all 49 names appeared. While that macabre list grew, a city mobilized. One of the first calls was for blood donations. People lined up for miles and hours, until the blood centers ran out of supplies and asked them to make donations. Other helpers focused on supporting the victims’ friends and families. 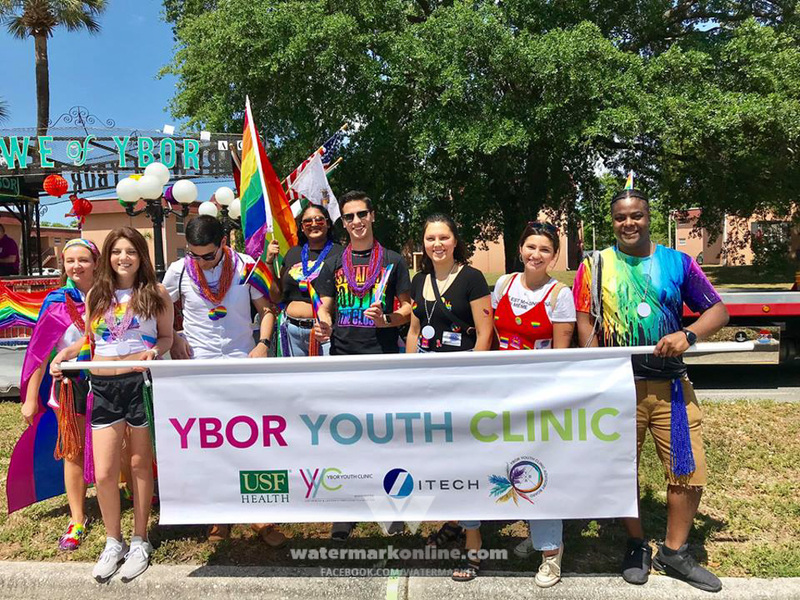 Dr. David Baker-Hargrove is the president of Two Spirit Health Services, who in partnership with Hope and Help, The GLBT Center, Zebra Coalition, Rollins College, Equality Florida, MBA Orlando, HRC and various other organizations are providing an emergency hotline and crisis counseling. Baker-Hargrove has experience as a disaster mental health responder and helped people after 9/11 and Hurricane Rita. “I knew exactly what I needed to do. We started to organize. The response from the counselors has been amazing,” Baker-Hargrove says, adding that they’ve signed on more than 450 volunteer counselors. He says the response was quiet at first, but things are picking up. “I had a feeling the [June 13] vigil would crack the egg and boy, oh boy, was I right,” he says, adding that a key partner in the effort is Lindsay Kincaide, with Hope and Help, who has been handling the complicated scheduling. For example, they’re arranging a support center onsite at Parliament House. He says they’ve probably spoken to hundreds of people in need of support so far but that number will grow. There’s another layer to these support efforts, because people volunteering, donating blood and providing other services need supplies, water and snacks and office supplies and paper towels and rubber gloves and all of the other things we take for granted when a disaster isn’t unfolding. Donations of those items have been pouring in, and The GLBT Center and The Venue have taken point on collecting and distributing the donations. Both locations also have grief counselors on hand… and some furry friends. Star says The Venue hosted comfort dogs, and when she saw them, she smiled for the first time in two days. Less than 48 hours after the sound of bullets filled Pulse, the city gathered on the lawn between the Dr. Phillips Center for the Performing Arts and City Hall for a #OneOrlando candlelight vigil. According to United Against Poverty Orlando, about 7,500 people attended the June 13 vigil. Many carried signs with the names of those who lost their lives; some clutched photos of victims, others carried banners with messages of love and hope. Several areas along the lawn were dedicated to memorials filled with flowers, cards and small stuffed animals. A section on the lawn had six large streamers, each a different color of the rainbow, laid next to each other in the shape of a remembrance ribbon. The mood was not only that of love for our city but of a need to help the community. Several groups walked throughout the crowd passing out bottles of water, snacks and fruit. The vigil started shortly after 7 p.m. with former Orlando state representative Joe Saunders, holding back tears, talking about coming to Orlando in 2001 to attend the University of Central Florida and remembering when Pulse opened their doors in 2004. Mayor Dyer and Orange County mayor Teresa Jacobs, along with many local and state officials, also addressed the crowd. Dyer thanked the Central Florida LGBT groups and organizations and the local police department for their efforts to help the grieving city. A series of speakers from all walks of life took the stage, introduced by Saunders, all offering support and love to the crowd. 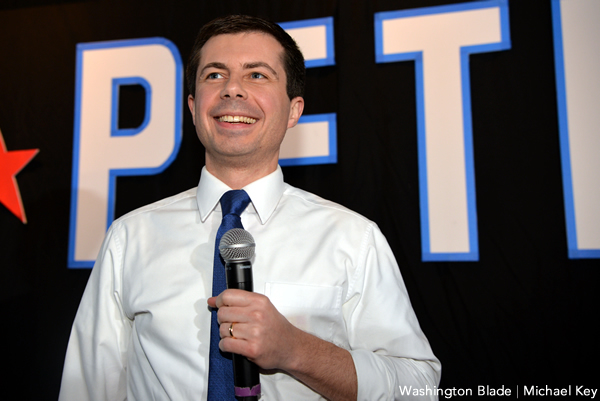 Members of several churches and faith-based radio programs spoke about conquering the hate and violence with love and acceptance, offering support to the LGBT community. Imam Muhammad Musri, president of the Islamic Society of Central Florida, condemned the actions of the shooter, saying the suspect’s views do not represent the views of the Islam faith. When Poma, Ledger and the crew of Pulse stepped onto the stage, they were greeted with thunderous applause and cheers. Neema Bahrami, the promoter for Pulse’s Latin Night, was there during the shooting. He told the crowd that Pulse will reopen. Because the killer attacked on Pulse’s Latin Night, most of the victims in the attack were of Hispanic descent, and many representatives from various Central Florida Hispanic organizations spoke to the packed lawn. Smith passionately told the gathered mourners to stand up against all the phobias in this nation. President of the Human Rights Campaign Chad Griffin spoke about the need to end violence and enact smart gun control. 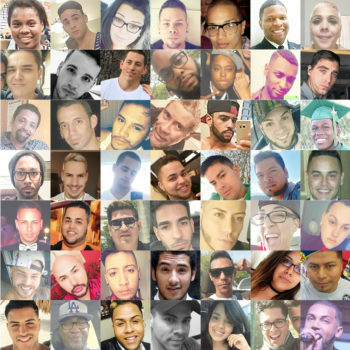 Click the image above to read about the 49 people killed in the Pulse massacre. As the sun set, First Unitarian Church of Orlando’s Reverend Kathy Schmitz, and other Orlando faith leaders, asked the gathered mourners to light their candles. The bells in the tower of the nearby First United Methodist Church of Orlando tolled 49 times, once for every life lost. “Be at peace, my friends. There is a long journey ahead and we will make it together,” Schmitz said after the bells had silenced. Most of us, already exhausted, must now look ahead to a road that is long and grim. Binks is confident that Pulse will rebuild, and when it does, she’ll go back to work. Star is trying to juggle her role managing services and donations through The Venue with her role as a member of the Pulse family. “I’ve got friends who don’t have jobs, they have people in their lives that they have lost. It’s not like they just don’t have work, they also climbed over dead bodies to get out of the club. They also lost their friends. They have horrific stories about hiding in the dressing room for two hours or crawling through AC vents. They have stories of gunshots and people running. And our business is what they know, so how do you go back and work in a bar? How do the patrons that were there just go back and have a good time? It changes everything,” Star says. She says it’s crucial that the community – both the local LGBT community and Orlando as a whole – understand that this recovery is “a marathon,” a long-term situation. A marathon recovery needs financing. Several GoFundMe accounts have been established for the victims, survivors and their families. The Pulse Victim Fund, started by Ida Eskamani on behalf of Equality Florida, has more than 81,000 individual donations totaling $3.7 million. GoFundMe themselves is the largest single donator with $100,000. A second GoFundMe, started by The GLBT Center’s board president Timothy Vargas, has more than 8,000 individual donations and has raised more than $300,000. The city of Orlando has created a OneOrlando Fund to support victims, their families, affected communities and to fight the underlying causes of the tragic shooting. So far, the Walt Disney Company has donated $1 million, Darden Restaurants donated $500,000, The Orlando Magic and JetBlue have each kicked in $100,000 and Mears has contributed $50,000. That might sound like a lot of money, but it goes far beyond simply covering funeral costs. There are severely injured victims whose recovery will be lengthy and expensive, who are likely unable to work for a long time. All of Pulse’s employees are newly and indefinitely unemployed. And yes, the families of the deceased have to pay for memorials and cremations and cemetery plots and travel costs and time away from work. And around the city, 49 families have funerals to plan. We have grieving and processing and crying to do, and it’s going to take a while. But with the support of the community at large and allies around the world, Orlando will reach the end of this road. Our pulse will keep beating. Jeremy Williams contributed to this story.